Our own Jim Boykin is also featured in the book! It’s not enough to be unique. You have to be in demand and valuable enough to get paid. Have you seen the More Cowbell sketch from Saturday Night Live? It’s more than funny- it’s a metaphor for a successful work life. 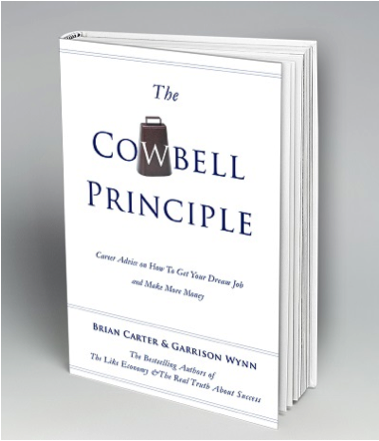 Everyone has at least one cowbell — it’s your unique, profitable talent people pay you for or your company’s unique offering. It’s something people have a fever for. When you discover it and give those people a ton of it, you gain success and happiness for both yourself and others. It’s a win-win. You don’t have enough passion to do it 40 or more hours a week. No one would pay you to do it, so you don’t have 40 spare hours to spend on it. Your hobby may be unique, but if there’s no demand for it, it has no value for others. It might even disturb some people that you want to do it. Tons of people can do “stupid human tricks” that are interesting but useless. We just watched a video where a boy broke the world record for the highest musical pitch ever whistled. So what? Who would pay for that? The reality is that dogs would not show up for this guy — and even if they did, dogs rarely have money. It didn’t even sound entertaining. Most world records are pointless. The greatest achievement of the guy with the world’s longest fingernails is pretty much just being gross! If you want to make money, uniqueness isn’t enough. Everyone has a unique fingerprint but no one is trying to buy your fingerprint (if they are, you should be suspicious.) You must be unique but also uniquely valuable. Brian discovered in his 20s that when you truly help another person at a deep or transformative level — if you can change or perhaps even help save a person’s life — you find a satisfaction and meaning unparalleled in life. We are made to help each other, and that’s why it feels so good. Brian never experienced that kind of contentment — the feeling that he was okay and in the right place — from anything else. Not from eating an expensive meal. Not from tons of retweets on a blog post. Not from writing a weird book based on a ridiculous Saturday Night Live sketch. Garrison discovered in his 20s that he would wait until his 30s to actually do anything significant. But in his 30s he too found that helping others was what made life better for everyone. And it was why humans survived as a species when we were otherwise not so well equipped. We helped each other. We depended on each other. You could not single us out like water buffalo and take us out one by one. We would come back and gang up on you. A mother lion or gorilla might protect its young briefly, but we humans were consistently willing to die for one another for the survival of future generations. We might not have had speed, strength, toughness, or what might be perceived as common sense or instinct by other animals, but we just kind of refused to be extinct. We took advantage of our brain and our ability to see the big picture and literally removed ourselves from the food chain. That’s the human race’s cowbell. The other animals can’t wipe us out. If we go extinct, we’ll do it ourselves and take everything with us! Okay, that’s dramatic. The point is that all humans are naturally born to succeed, though we are different and have varied talents. True to form, we want to help you discover your talent. Roger Montti (Martinibuster) Joins BOTW Guys!